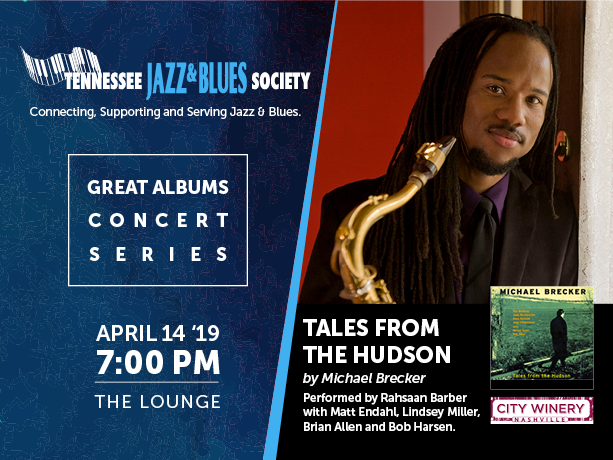 The Great Albums concert series continues with “Tales from the Hudson” by Michael Brecker performed by Rahsaan Barber. Sunday, April 14, 2019, in The Lounge at City Winery Nashville. Doors open at 5 pm and the show begins at 7 pm. Tickets are $20 for general admission and $15 for TJBS Members. Members will receive the discount code via email prior to the show. Tickets can be purchased from City Winery’s website. Rahsaan will be joined by pianist Matt Endahl, guitarist Lindsey Miller, bassist Brian Allen and drummer Bob Harsen. Click on the image below to purchase a ticket!